Thanks to everyone for their kind thoughts and sympathy over the loss of our dear Miss Sophie. It hasn't been an easy time for us, but the friendship of everyone in Blogland has been of great comfort. 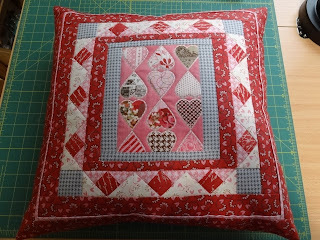 I have been spending some time back in my sewing studio and just finished a Valentine pillow! 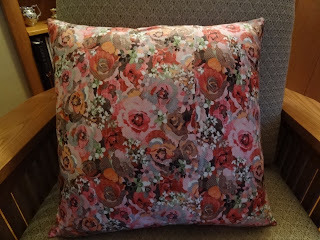 The pattern is called Nostalgic Christmas Pillows from my friend Lynn Wilder of Sew'n Wild Oaks blog. Lynn is a very talented designer and has the most delightful blog! But this isn't a Christmas pillow, you say. Lynn has shown many different "holiday" styles for her design - the possibilities are endless! 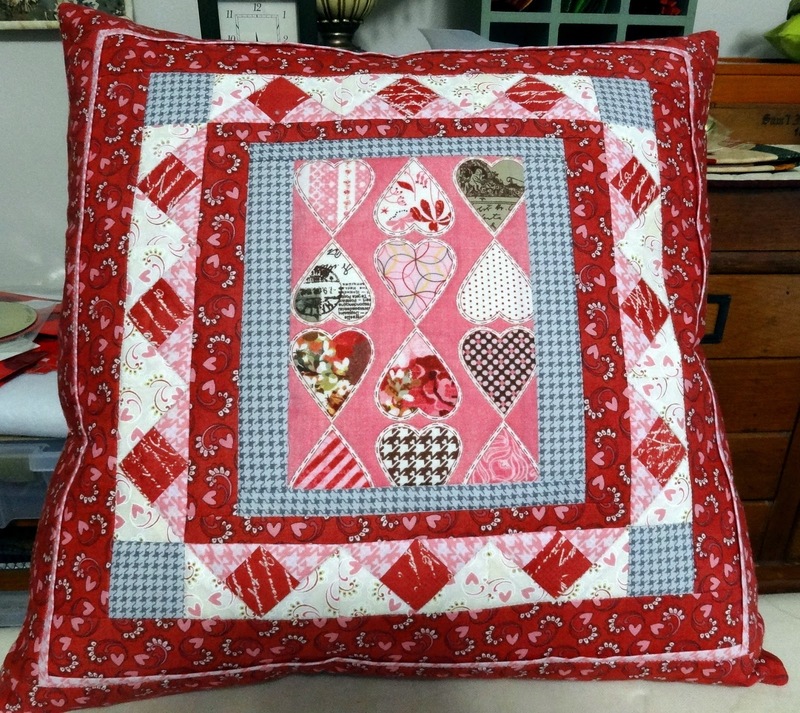 You can jump over to Lynn's blog and check out several of her posts on the pillow for ideas. The lighting in our house isn't the best for photos right now. We have gray and cold skies, so I moved it around to try and get it in a good light. I used Basic Grey's new Kissing Booth line for the most part. I believe the gray houndstooth is the only fabric not in the line. The back is done in the classic "envelope" style so all you have to do is open the envelope and slip in a pre-made pillow form! It's a fun and relatively easy pillow to make and I got to learn how to make double flying geese - something I had never heard about before this project! I am slowly getting back to blog reading and commenting. Next week Mr. Squash and I plan to get out of the house for a bit and possibly drive to California for a week or so. Best wishes to everyone for a great 2013! What a beautiful pillow, Candace. BTW, how is the long arm quilting coming? I've never really mastered mine but enjoy it anyways so I keep at it. You and Mr. Squash have a wonderful 2013. Safe Travels when you hit the roads. What a gorgeous pillow and I love Kissing Booth. I wish I could master the art of pillow making. Lynn's blog has lots of great tips and hints. Thanks for the link. Happy Trails wherever the road leads. Love that pillow - I haven't heard of double flying geese either, but I love them! They add so much movement. Been thinking of you - hope you and Mr. Squash have a good week - a little trip might be just the ticket! Candace your pillow is gorgeous! Love the Kissing Booth fabric....just perfect. Heading to California??? Head on over to our cabin and you can help us shovel snow. I hope you have a wonderful year of quilting, gardening and fishing with Mr. Squash. 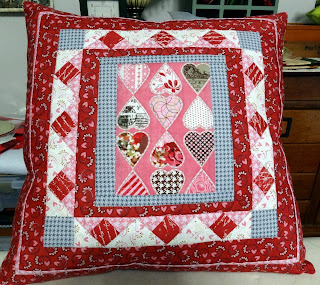 That is such a pretty Valentine pillow. Gorgeous pillow, Candace! I agree that pillow is multi-seasonal. Beautiful. A drive to Cali sounds like a wonderful idea!!! Wishing you a Happy New Year. Oh, that is a very pretty pillow. I do like the backing too. I read Lynn's blog and she is so talented. Hope the sewing time gave your mood a nice boost. It is really pretty! Love the heart print in the center (at least I think it is a print!). A little vacation sounds lovely. What a adorable Pillow ! Have a fun trip to California ! It has been cold but sunny here ! I am sorry about your Sophie. My daughter and her husband had to say goodbye to their rescue cat shortly before Christmas. They provided Ivan with a warm home and the best of medical care for the 15+ years they had him. Happiness in the New Year! Lovely pillow! I love the fabrics. I'm so sorry about your kitty. Our pets are our family, and I know how difficult it is to lose one. I hope 2013 brings you only wonderful things! What a pretty little pillow. And aren't you smart for already finishing a project for the next holiday! I am impressed! Happy New Year. Your pillow is adorable! Well done! Lovely pillow, Candace. 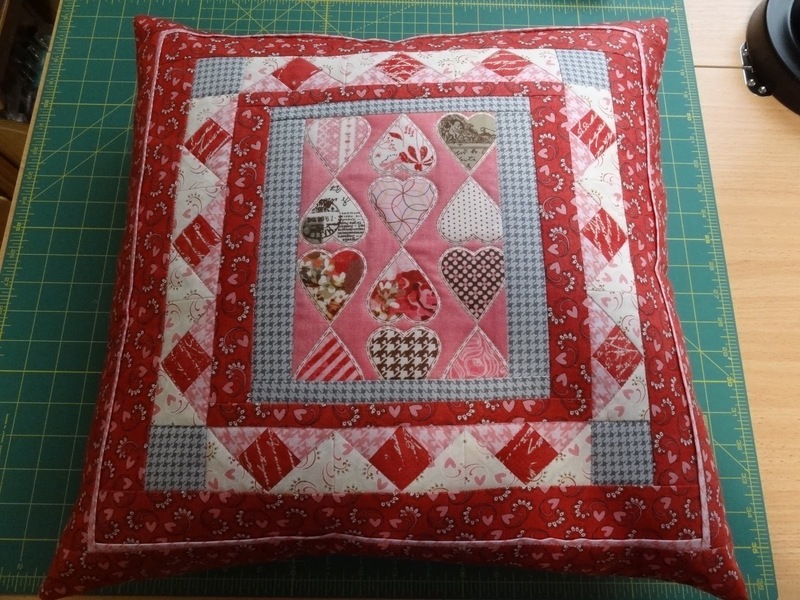 I just received an email from Fabric SHack and one of the Valentine fabrics they featured was the one you used for your pillow.I might just have to get some! Happy trails on your trip to California. I'm soooo envious! That is a beautiful cushion. Dear Candace, I am so sorry to hear about your kitty! May her sweet soul rest in peace! I am so sorry for your loss. The pillow is sweet and inspiring. Next holiday comin' at us! Happy New Year to you and your Mr.
What a beautiful Valentine pillow. Good luck on yor trip.